The Nubian can be proud of their language and should be reminded of the old Nubian, the language of the medieval Christian kingdom, is the only African non-Afro-Asiatic language which developed a literature written for at least 700 years,i.e. from the 16th to 15th A.D. The study of old nubian and the publication of the texts discovered in different campaign's is still going on. Language: The Kenuzi speak Kenuzi-Dongolawi while the Fedidja speak Fedidja-Mahas. There is also a group within the Nubians who have become Arabicized to the point that their first language is now Arabic. Most of the men today are bilingual, speaking their Nubian language and Arabi." Dongolawi and Kenzi. Kenzi is spoken north of Mahas in Egypt while Dongolawi is spoken south of Mahas around Dongola. With population displacement due to the Aswan High Dam there are communities of Nubian speakers in Lower Egypt and in Eastern Sudan (Khashm el-Girba). Apart from these two distinct varieties spoken along the Nile, three other varieties existed." Birgid - originally spoken north of Nyala around Menawashei until the 1970s. The last surviving aged speakers were interviewed by Thelwall at this time. And some equally aged speakers on Gezira Aba just north of Kosti on the Nile south of Khartoum and interviewed by Thelwall in 1980." 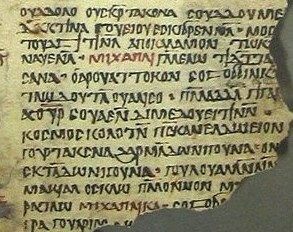 Old Nubian is preserved in at least a hundred pages of documents, mostly of a Christian religious nature, written using a modified form of the Coptic (Greek) script. These documents range in date from the 8th to the 15th century A.D. Old Nubian is currently considered ancestral to modern Nobiin." Midob in and around the Malha volcanic crater in North Darfur." Hill Nubian - a group of closely related dialects spoken in various villages in the northern Nuba Mountains - in particular Dilling, Debri, and Kadaru." The Nubians also have their own language. The old Nubian characterized by a writing system, was a unique language used in all the area, as many manuscripts found in many different places of Nubia testify. It uses the Coptic alphabet with the addition of other letters to write the typical Nubian sounds. The oldest manuscripts in old Nubian go back to the beginning of the Christian period in Nubia (middle of the 6th century). With the appearance of Islam in Nubia (about 13th century) Arabic became the dominant language. However Nubian continued to be used until today. The modern language is formed by many dialects (Fadiga, Kenzi, Sikut, Mahas, Dongolawi), which derive from the old one. Since they do not respect a fixed model of writing, everyone tries to create his own model in such a way that sometimes the writer himself cannot read it again especially after a long time!". Today many Nubians and foreign scholars are interested in the study of the Nubian language. This interest in its maintenance is very important for the Nubians since the language is the most important instrument to perpetuate the memory of a culture." Today Nubia is the region south of Egypt along the Nile in northern sudan, but in ancient times it was an African Kingdom. Its people spoke at least two varieties of the Nubian language group, a Nilo- saharan subfamily which includes Nubiin, Kenuzi-Dongola,Midab and several related varieties in the northern part of the Nuba mountians in south Kordofan. A variety - Birgid was spoken ( at least until 1970) north of Nyala in Darfur but is now extinct . Old Nubian was used in mostly religious texts dating from the 8th and 9th centuries A D. it's considered ancestral to modern day Nobiin .The Nubian language stayed alive since the early days of history in spite of all events faced the nubians throughout all ages and in spite of all peoples who invaded Egypt . When ethnologists speak of "Nubia," they usually mean only the land occupied by the people who speak dialects of the Nubian language. Nubian-speakers live between Kom Ombo, about 30 miles (50 km) north of Aswan in Egypt, and ed-Debba, Sudan, about 180 miles (300 km) northwest of Khartoum, Sudan. Before the fifteenth century, when the spread of Islam became very widespread in Sudan, Nubian-speaking peoples occupied a much larger area, even including the land southwards up the Blue Nile. Their descendants live there still, but today they speak only Arabic. The scientific study of the Old Nubian language started very late, in 1913 by Griffith' monumental edition of all available Nubian text then. This was followed by several studies of other scholars. During the Christian Nubian era the Old Nubian alphabets had resemblance to Old Greek and Coptic alphabets. Both Coptic (31 or 32 letters) and Old Nubian (26) had more letters than old Greek (24), either to add special letters with no equivalent in old Greek (the Old Coptic) or to represent special sounds (the Old Nubian). As for today no standard method of writing Old Nubian has been adopted. However recently some scholars are active on establishing such a standard like Prof. Browne and Dr. M. M. Khalil. Recently the Nubian Archaeologist Dr. M. M. Khalil has drafted a textbook on how to write old Nubian. His study is based on an assumption that since Old Nubian relies mainly on produced tones (intonation or chanting) then a Nubian who talks and masters the language is more qualified and capable to establish a standard method of writing. The structure and formation of the Old Nubian language is characterized by its reliance on produced tones that is known as intonation or chanting. In this respect the general structure of this language is not a group of words linked by a common syntax to form a sentence. The speaker tackles this formation by putting parts together integrally with intonation and chanting. This takes place without interruption to conform with grammar thus most parts of a sentence are composed by adding a suffix or prefix to the word stem.